The mysterious disappearance of Maxville's reeve, W. A. MacEwen , at Cornwall, January 21st, recalls a like occurrence of nearly 50 years ago that occurred here in Alexandria. A prominent resident of Peveril, Que., in the Ste. Justine area, A. H. McCuaig, 29, drove to Ste. Justine on Saturday, May 2nd, 1908, boarded the train for Alexandria, spent the balance of the day in town and was never seen again, According to our local historian, Clarence Ostrom, the mystery of Mr. McCuaig's disappearance was never solved. 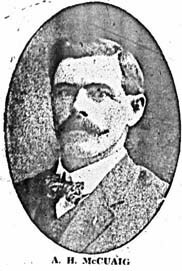 News' fliers of 1908 recall that his brother, J. H. McCuaig, of Peveril, became alarmed when he failed to return home and started a search for the missing man. Police at Montreal and Ottawa were asked to be on the lookout for him; the help of local agents along the railroad line was enlisted. Fearing the man might have fallen off the train while en route home, friends followed the railway tracks from Ste. Justine to Alexandria. Later in the week a group of his friends came to town, had an interview with Police Chief A. P. McDonald and then proceeded to make a thorough but vain search of the town and surrounding district. Rumors were prevalent in those days, too, and one that gained currency was to the effect Mr. McCuaig had been knocked over the head and dumped into the town standpipe. It was not made clear how the murderer could have carried the body up the steep side of the 100 foot water tank, but so persistent was the story that town officials emptied the standpipe. That was not he solution, and Mr. McCuaig's disappearance 48 years ago still remains a mystery, as far as we know. I have just had a request from an Ian McCuaig, Dalhousie Station Quebec J0P 1GO -1-514-764-3464 who is looking for an Archibald McCuaig born 1870 April 13, at Newton Quebec, baptised Cote St. George Quebec son of Ewen and Christina McCuaig. This baptism is from my work on Cote St. George 1990. In 1908 Archie disappeared while on a trip to Alexandria, Ontario from his home in Pervil, Quebec and was never heard from again. In the 1930's a John McLeod from the 8th of Lancaster township Glengarry County was working in the mines in the Val D'or Rouyn area of Quebec and met this Archie on the street, recognize him, asked where he was from and was told Pervil, ask to meet him later but Archie never showed up and that is the last known spot where Archie was seen. On checking out for historical and genealogical groups in Quebec on the Internet I find no reference that I recognize dealing with the Val D'or/Rouyn/Noranda Quebec area. Neither did I notice anything in the Canadian Genealogy Resources page. My question is are you aware of the names and address of Any newspapers in this area that a letter can be written to ask for information on this Archie McCuaig. It is believed that this Archie could have lived into the 1950's, thus if he lived in the Val D'or/Rouyn/Noranda area some people may still remember him. Can you provide Mr. McCuaig with any suggestions on how to proceed. Likewise the names and address for Historical or Genealogical Societies in this area that he may contact. Ian McCuaig is updating his family history and wishes to find out more about this lost Archie. You may contact Mr. McCuaig directly at his Dalhousie Station Address as above or through me with any information you might be willing to pass on. The above letter was sent by e-mail to the Val d'or public Library; Rouyn Noranda Public Library; The Quebec Family History Society, Pointe Clair, Quebec; with no results. There was a rumor that This Archie McCuaig worked for Siscoe Mines which I found out in October '97 from the Kirkland Lake Museum, that, that mine operated in the Kirkland Lake, Ontario area prior to 1950. Mr. Ian McCuaig of Cote St. Patrick, Quebec is a grand nephew of this Archie H. McCuaig and if possible wishes to learn more about the whereabout of this Archibald H. McCuaig, whose whereabouts is a total mystery.